CORAL SPRINGS, Fla. - A Coral Springs man wants police to pay for the fence that they damaged while responding to a home invasion call. Bruce Rosenberg said he was working May 30 when he got a call from his wife, who told him that someone was outside their Coral Springs home. Rosenberg said he raced home on Florida's Turnpike, worried for his family. "I only really eased up a little bit when I saw that the officers arrived at the house," he told Local 10 News. 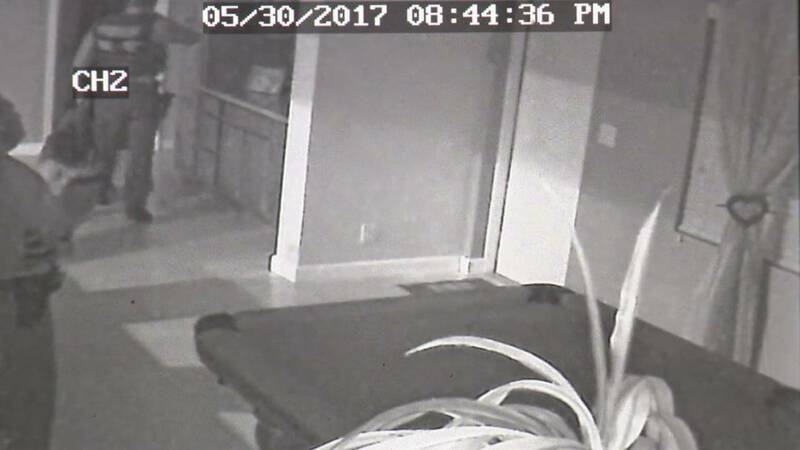 His home security cameras captured his children locking themselves in a bedroom and his wife peeking through windows. Once his family was out of the house, Coral Springs police entered with K-9 units. They later learned that the car that pulled into Rosenberg's driveway had been stolen in Fort Lauderdale. Rosenberg's cameras helped police track down the passenger, who led them to the 17-year-old driver. The teen was later arrested, but that's the least of Rosenberg's concerns now. Surveillance video shows Coral Springs police inside Bruce Rosenberg's home. Rosenberg wants someone else to pay for what he said was unnecessary damage to his fence. "They had access to my house. They had access to the back door to get into the backyard," Rosenberg said. "They didn't need to rip my fence down." Coral Springs police Capt. Brad McKeone spoke to Local 10 News about Rosenberg's fence. "I know Mr. Rosenberg may be a little frustrated, but all I can say is that we will review everything," McKeone said. McKeone said officers often have to break through fences, doors or windows to protect themselves and others, but he said it isn't uncommon for the city's insurance to pay for the damage. Rosenberg will have to wait until the review is finished. "I am 100 percent grateful that they came and did their job and that everyone was safe. … I just don't think that I should be responsible, ultimately, for paying $1,900 out of my pocket," Rosenberg said. The city could go after the suspect and ask prosecutors to seek restitution to cover the damage. Rosenberg's review could take about 30 days before the city makes its decision.